and enjoy marvellous views over Lake Unnen! 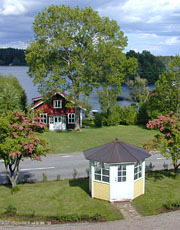 With us you stay in beautiful surroundings with a magnificent view over Lake Unnen. We are situated in the landscape of Småland but in the County of Halland. Within 50 kilometres you have the sea with its excellent sand beaches. Alebo is easy to find, see our road description [here]. Open all year except for the week including Christmas and New year. A laptop computer with internet is placed in the hall for free use. All of our guests have entrance to our lounge on the first floor of the main building, where you will find a TV set with a choice of DVD-movies to enjoy and everybody can hire the sauna in our annex with entry to our private beach. A comprehensive English breakfast buffet [see pics] is served to all our guests 8:00 AM to 9:30 AM.